The goal of this car is to bring out the sporty qualities of the V8 Vantage. That means more power and less weight. It bucks the usual trend for an Aston Martin. It's low, it's loud, and it's covered in race car parts. All of the brightwork has been replaced with carbon fiber or black items, along with a Frankensteinesque collection of parts from various Aston Martins. It's a one-of-a-kind V8 Vantage and I absolutely adore it. My first Aston Martin, I bought this car in 2011 from a couple in Tampa, FL, who are now extremely close friends. It had been used to develop and test the prototypes for RSC Tuning's products way back in the day (that company has since changed hands, and one of the lead guys from the original group, Stuart, moved on to create VelocityAP). This car has changed a lot over the years since I've had it. When I first bought it, it already had wheel spacers with extended lugs, high-flow cats, a 'sport' muffler, H&R springs, and a few other little things. It came from the factory with the usual assortment of popular options, like navigation, Premium Audio, heated memory seats, auto-dimming mirrors (how was that not standard??? ), and so on. The original owner also had the Power Pack fitted, which was a nice bonus. Let's start off with the fun stuff: race car parts! Like many modifications to a car, race car parts are a double-edged sword. The typical concerns for most modifications are typically along the lines of the price, comfort, OEM-styling, performance gains, or stigma (or any combination of those, or all of them). Race car parts have a very distinct concern on top of that.... safety. So although the race car-sourced modifications done to my grey V8 Vantage score very high on the cool factor, they may not be practical for more people. The front bumper fascia and carbon fiber side sills are from the original Vantage GT4. The standard front bumper armature was removed and replaced by an extremely lightweight aluminum bar. The armature supports quite a bit of the front end's components: the headlights, the intake duct inlet, the oil cooler, the tow hook, the grille, and the safety latch for the hood. By removing it, numerous changes had to be made. Prodrive (Aston Martin Racing's main supplier) supplied the mesh grille, tow strap, and headlight support brackets, but custom brackets had to be made to support the oil cooler and the intake duct inlet had to go. Since the inlet was not longer able to be used, I took out that as well as the ducts and even the air boxes. The engine intake filters are now open to the elements and supported by air box delete brackets. The inlet, ducts, and N400 air boxes add up to 11 lbs 2.3 oz, which have been replaced by 3D-printed brackets weighing only a few ounces! Another reason for removing the air boxes is that the GT4 front bumper fascia has brake cooling duct inlets that take up space where the air boxes would be. I've been using brake cooling ducts that source air via NACA ducts in the front undertray, but I'll be making new brake cooling ducts routed from the front bumper fascia to replace the current setup. I had been running a set of BC Forged RT50 wheels in Redpants fitment for a couple years on this car, but now have a set of Widepants fitment RZ05 wheels on it. Long story short, the RZ05s were meant to go on our red V8 Vantage project car. But I put them on my grey one to get some pics and.... well... everyone, myself included, fell in love with the look. So they stayed. I still absolutely love the classic-but-modern look of the RT50s, but the RZ05s just freshen up the car so much and are a better match for its current aggressive styling. I mean, look at this thing! The RT50s I had on the car were the same width and diameter as the OEM 7-spoke wheels, but with a more aggressive (and far more suitable!) offset. The RZ05s, however, are much wider. The fronts have gone from 8.5" wide to 9.5", and the rears have gone from 9.5" to 11" wide. With the extra wheel width comes wider tires. I loved the Michelin Pilot Super Sport tires I had on the RT50s, but Michelin came out with an updated version called the Pilot Sport 4S. I went with the PS4S tires in a wider size: 265-width in front and 305-width size in rear. At first I was honestly opposed to the sizing. As a fan of weight reduction, the wider size wheels and tires negated the huge weight savings I'd enjoyed with the RT50s and Super Sports. But having had the RZ05s and PS4Ss on track... all I can say is, "It's worth it." The added grip is just amazing, and my nerves gave out before the tires ever did. The V12 Vantage hood is a direct swap onto the V8 Vantage, but you'll need a few things to finish out the hood. You'll need the hood itself, plus new inserts for the vents, a new insulator pad, and capped nuts to mount the vent inserts and insulator in place. You might also want to opt a new wings logo badge while you're at it. I decided to get the mesh vent inserts rather than the carbon fiber louvers because I think they look a lot less fussy, plus they're much less expensive. You don't need to get aerocatches for the V12 hood if you still have the front bumper armature. 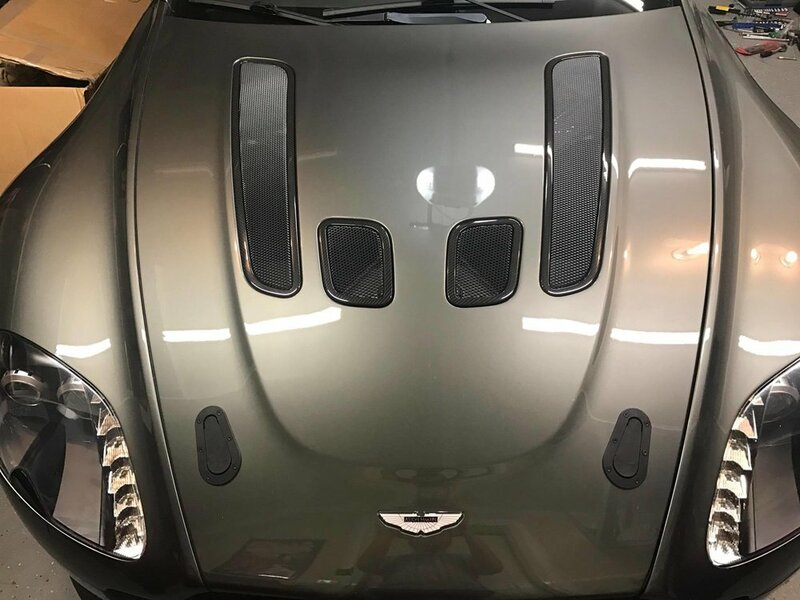 I have them on my car because of my lightweight bumper beam from Aston Martin Racing - it eliminates armature along with the safety catch for the hood, so I needed the aerocatches to replace that lost functionality. When I bought the car, it was covered in brightwork: the front grille, the fender vent strakes, the window trim, tail pipes, and so on. But as the carbon fiber started piling onto the car, the brightworked got replaced piece by piece. Eventually, all that was left was the chrome-finish trim around the windows. It stuck out like a sore thumb (at least to my eye), so it had to go, too. Aston Martin's Exterior Black Pack includes the Carbon Edition 6-bar grille, black window surround trim, and Zircotech-plated (think black chrome) tail pipes. Since I can't use the 6-bar grille due to my Aston Martin Racing lightweight front bumper beam, I set that aside for sale on its own and went straight to the black window trim.